An effects standard now made for the thumper throng. 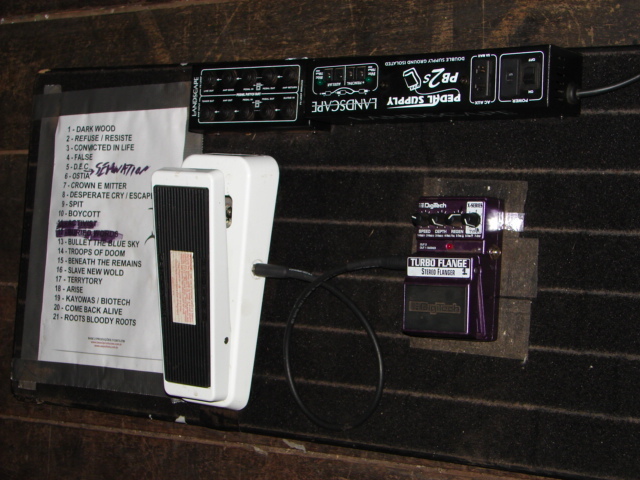 In this photo of Omar's pedalboard during the early The Mars Volta recordings, he used a Dunlop Bass Wah, at the bottom left side of the board. 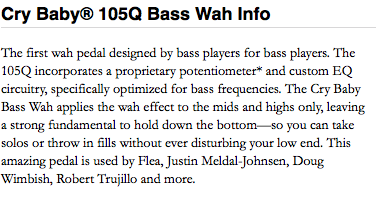 On the [product page](http://www.jimdunlop.com/product/105q-cry-baby-bass-wah) for the Cry Baby 105Q Bass Wah, it says, "This amazing pedal is used by Flea, Justin Meldal-Johnsen, Doug Wimbish, Robert Trujillo and more." 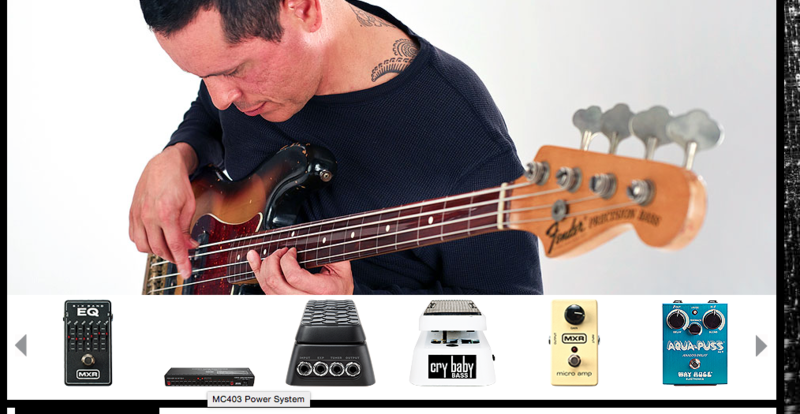 According to [this page](http://www.jimdunlop.com/artist/juan-alderete) of Dunlop's website, Juan Alderete uses a Dunlop Cry Baby 105Q Bass Wah Pedal. As seen being used with Black Label Society. He also mentions using Jim Dunlop wah pedals on the Behind The Player DVD, although the exact model isn't seen. on the right corner we can see that white wah pedal on Johnny's pedalboard. As seen in this image, Wolfgang Van Halen uses the Dunlop Crybaby 105q Wah pedal live. At :28s of this video we can see a 105Q Bass Wah Pedal. "It's more aggressive than the normal one. I love it, it's huge." "I just mostly use it in the Hollywood endings only, they don't give me space to use it more than that." At 8:20 in this Rig Rundown for James Shaffer of [Korn](http://equipboard.com/band/korn), his gear is shown, displaying a Dunlop Cry Baby 105Q Bass Wah Pedal. The pedal can be shown right next to the Tone Bender. At 16:38, Troy says that he uses a Dunlop Wah, which is shown on his pedalboard. By it's color it can be identified as a 105Q Bass Wah Pedal. At 3:30, Brent explains why he uses this pedal, made for bass guitars, saying, "I use the bass wah because the envelope is way more dramatic and you don't have to click it...it really gets a dramatic effect out of it." Brian uses a bass wah by Dunlop for "filtre sweeps". This site states that Graham uses a Dunlop Cry Baby 105Q Bass Wah Pedal. In this picture of Paulo's pedalboard, we can see a Dunlop bass wah. Confirmation of this being Paulo's board can be seen [here](https://www.flickr.com/photos/sepulturacombr/2791724579). 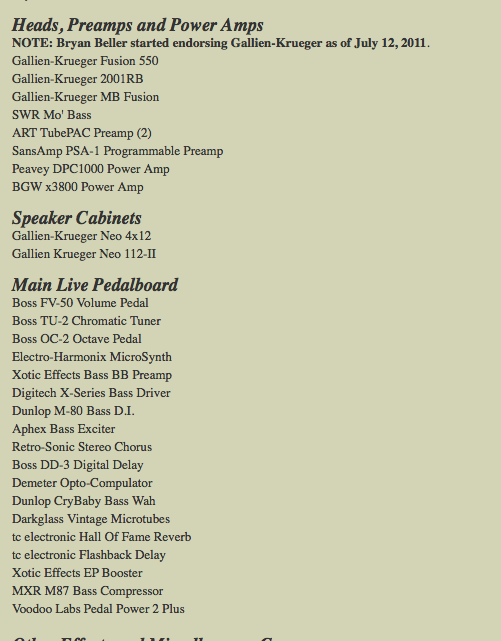 According to his [official website](http://www.bryanbeller.com/cms/index.php?page=gear), Bryan Beller uses a Dunlop CryBaby Bass Wah pedal. The 105Q is on the far left of his setup. 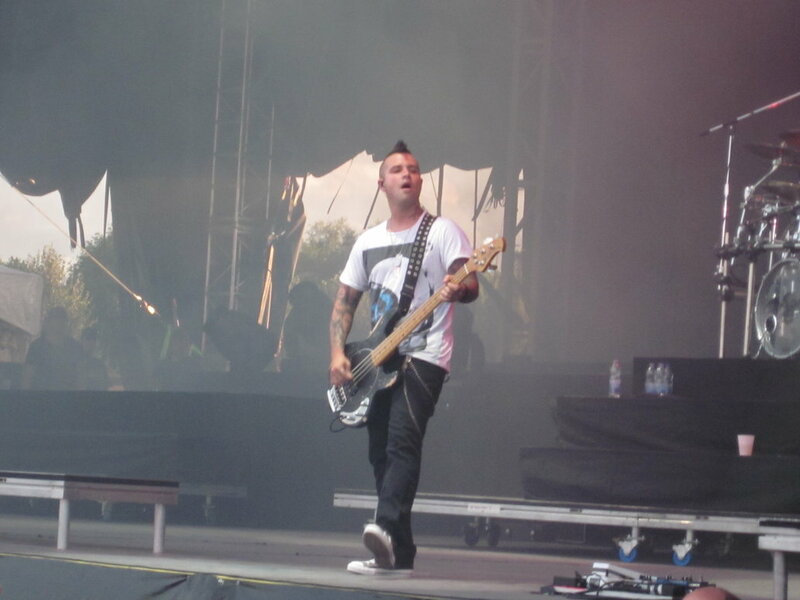 In this photo his pedal can be seen. According to East's artist page on the Dunlop website, he uses a Bass Wah. Steve Jenkins' Cry Baby 105Q can be seen in this photo, posted to his [Facebook](https://www.facebook.com/therealstevejenkins). "I use a Crybaby bass wah, an envelope filter, two octavers that each play an octave up and an octave down, TC’s Polytune and a bass booster." Can be seen on his pedalboard throughout the live performance. According to Premier Guitar's rig rundown of Intronaut, Joe uses a Cry Baby Bass Wah Pedal. As can be seen in the right-hand side of the photograph, Marc Dorendorf uses the Dunlop Cry Baby 105Q Bass Wah Pedal which is sitting next to a Boss DS-2 Turbo Distortion. bypass is good, it's build is great, the size could be smaller. i love that their is no foot switch. the wah works great with slap. you really have to whip your foot and fingers to get a cutting noticable sound. dirt being fed into it is always good. it does retain the lowend, probably the dryest wah out their. i forgot to mention that you can find the 105q at a good price. when it comes to wahs, unless it's optical, buy brand new. i mostly give this pedal 4 stars because it's not perfect. dunlop make more. also, works great on guitar. No bells or whistles. Just a straight up Bass Wah. If you're needing a bass wah, might as well be this one. No complaints against it except maybe the price for them brand new. I was practicing and getting awesome sounds. I mix this with the fuzz that Bass Big Muff gives and sound really great. If you love play bass and want to try new sounds I strongly recommend this one. I know it's not usual bass players use wahwah effects but it's fun, different and gives you a lot to try. I have to admit, that I don't think that I would use often this one in a gig, but I can enjoy it playing alone or on a gig. BTW, I love EHX pedals (my personal favorite brand) but sorry, I didn't like the Crying pedal without moving parts. I prefer my wahwah in the classic way. This pedal will bring the funk straight to you, it will slap you in the face and funk you up! doesnt compare to the original very well, they're very different. I love the adjustable volume.